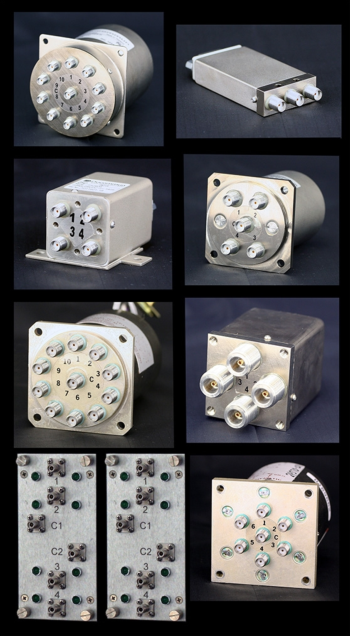 CXM DC to 40 - Cytec Corp.
CXM Series - Cytec Corp.
this series is typically used for frequencies from DC to 40 GMHz. 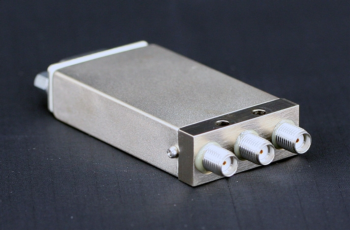 We use microwave relays, splitters, programmable attenuators and many other microwave components from the worlds most popular vendors to build standard or custom systems to your specifications. 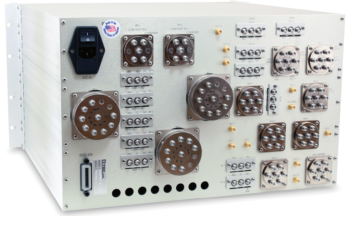 There are a large variety of 1x2 through 1x12 microwave relays available in Normally Open, Failsafe, Latching, Terminated or special configurations to suit your needs. Or simply buy the driver chassis and use it to control your own components. Since Cytec doesn't build microwave components we can put the systems together with whatever parts you prefer and stand behind the warranty for you. These Chassis controls up to 4 8x1 modules, 8 4x1 modules or mixtures of 8x1"s, 4x1"s, 2x1"s and 2x2 modules in any combination or configuration for up to 32 relay drives. LEDs on the front panel show switch and power status. Add Switch Modules and a Control Module to complete the system or simply buy the chassis wired out to D connectors to control your own relays. A pushbutton manual control is optional. 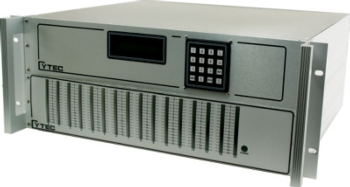 These Chassis controls up to 8 8x1 modules, 16 4x1 modules or mixtures of 8x1"s, 4x1"s, 2x1"s and 2x2 modules in any combination or configuration for up to 64 relay drives. LEDs on the front panel show switch and power status. Add Switch Modules, display / driver modules and a Control Module to complete the system or simply buy the chassis wired out to D connectors to control your own relays. A manual control is optional. These Chassis controls up to 16 8x1 modules, 32 4x1 modules or mixtures of 8x1"s, 4x1"s, 2x1"s and 2x2 modules in any combination or configuration for up to 128 relay drives. LEDs on the front panel show switch and power status. Add Switch Modules, display / driver modules and a Control Module to complete the system or simply buy the chassis wired out to D connectors to control your own relays. A manual control is optional. Chassis is available with sink or source relay drivers from + 5 to + 28 volts, ot TTL drivers for programmable attenuators. Firmware commands for Fade and Handover for WiFi, Cell Phone and WiMax labs. Fully custom systems built with little to no NRE. 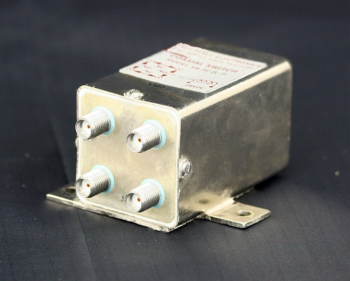 These Chassis are typically used to control relays greater than 8x1 or control multiple relays in series forming larger switches than normally possible such as 16x1 to 32x1 sections. Or control mixtures of 8x1"s, 4x1"s, 2x1"s and 2x2 modules in any combination or configuration for up to 256 relay drives. LEDs on the front panel show switch and power status. Add Switch Modules, display / driver modules and a Control Module to complete the system or simply buy the chassis wired out to D connectors to control your own relays. A manual control is optional. Cytec can manufacture custom microwave systems to your specifications. Need to build a switch with 6 different styles of relays? Want to combine relays, amps, splitters and couplers? Need to combine parts from 8 different vendors to meet the specs you want? 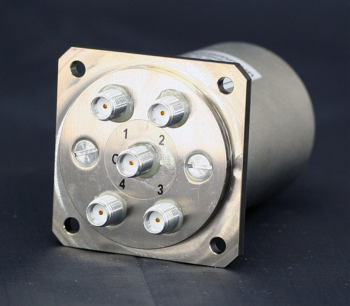 CXM/3x1 to CXM/12x1 - Cytec Corp.
CXM/3x1 to 12x1-NO-SMA Microwave Relays are Normally Open (NO) in the OFF state. Only one port can be on at a time. Larger configurations can be built by connecting the common port of multiple relays to another relay in series. 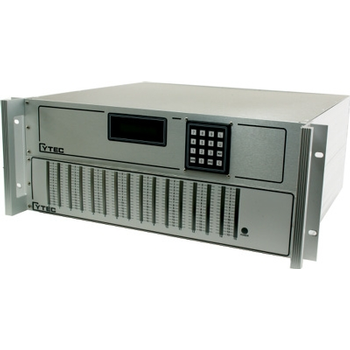 CXM/4x2-T-L-2.92 Microwave Modules are used in Modular CXM chassis to build matrix configurations with extremely good specifications. The system uses latching, terminated and hi isolation relays rated to 5 million cycles for ultimate performance and reliability.